If you haven’t yet shopped Amish Originals Furniture Co., then you haven’t yet shopped at the number one Columbus furniture store. Even though our storefront is in stunning, historical Westerville, people from all over North Ohio and beyond travel to shop with us. The bottom line is that we have everything you need to finish a room or an entire home, including the outdoors! If you haven’t already had the pleasure of browsing Amish handcrafted pieces, you don’t even know what you’re missing. The work that goes into each piece is like nothing that can even be replicated by other types of furniture. That’s because each piece is built as a special order and all by hand. By working with more than 70 different families in the Amish communities throughout Northern Ohio, we bring our customers only the best. Create the look you want for your home inside and out by shopping with us. Get pieces for your bedroom, home office, kids rooms or outdoor, plus so much more. Those consumers concerned about going “green” will be glad to know you have that option when you shop at Amish Originals Furniture Co. Your average Columbus furniture store can’t make that claim. So how exactly is this process green, especially compared to many others? There is no waste left behind. That’s right, all of the “scraps” are used for fuel, the sawdust used for bedding for livestock and all other leftovers are reused. The kiln dried, quality American hardwoods used are safer for the environment than other materials. This means there is no emitted formaldehyde. For the transition, we use blankets to wrap our furniture. This means not using disposable packaging materials. The sturdy Amish pieces you add to your home are always meant to last for years or generations to come. This means less cheap “DIY” furniture to end up in landfills as well as quality pieces that become heirlooms for generations to come. The finishing process used meets the EPA requirements. This means that you can feel good about buying Amish built furniture for your home. Don’t worry, at Amish Originals Furniture Co., we also work hard to do our part to stay green including working only with timber companies that follow guidelines set by the Ohio Department of Natural Resources. Everything that can be done to be a little “greener” makes us feel better too. 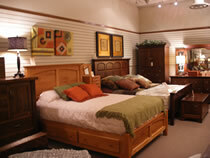 There are plenty of other reasons we are the furniture store Columbus Ohio of choice, without doubt. The rest you can find out about for yourself by stopping by and shopping in our store. From the selection and prices to the best customer care, you’ll be glad you gave us a try.